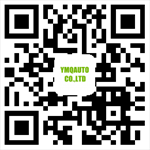 YMQAUTO was established in Ningbo Zhejiang in 2004, Mainly responsible for research and development of automotive supplies, domestic and foreign sales. Our team, full of vitality, good at learning, keep making progress. YMQAUTO is professional in the manufacture and sale of automotive supplies, automotive parts & accessories?spare parts?modified parts. Products are exported to Europe and the United States, the Middle East, Southeast Asia, more than 40 countries and regions, export business is growing. we provide customers with convenient, fast, quality service as the principle, provide first-class quality service for customer.